Do you have siblings who overshadow you in all aspects of your life? Are they better looking, funnier, more successful, and just plain more likable than you are? But if you asked those same questions of the tomatillo, you’d get a whole lot of head nodding. Not literally. It is, after all, a vegetable, and has neither a head nor the neck on which to nod it. 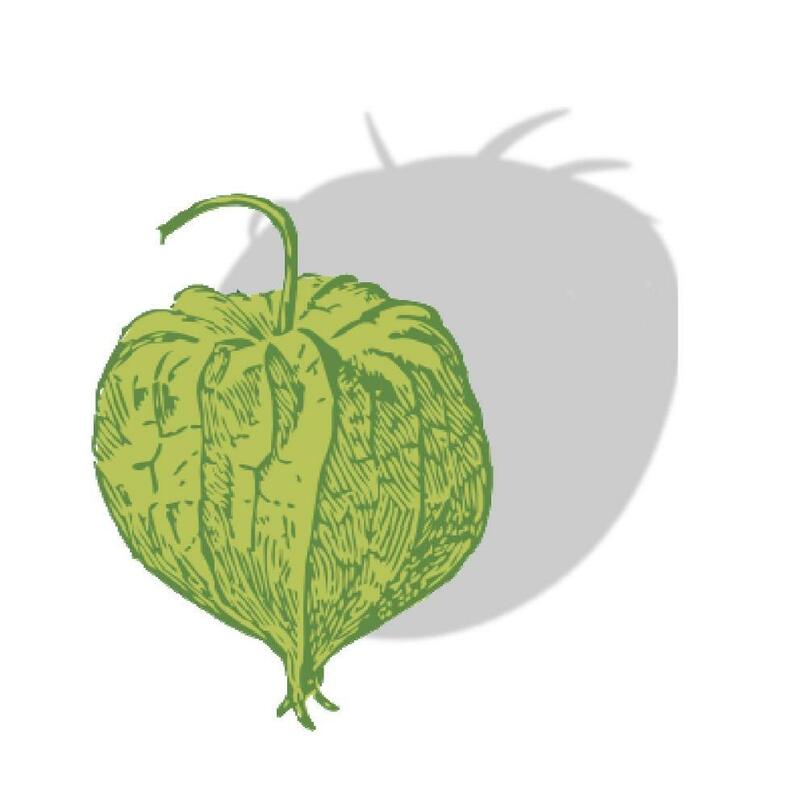 What the tomatillo does have is pale green skin; a papery husk; a tart, lemony taste; firm texture and a cousin from the right side of the tracks who’s a big star. Imagine being the unsung relative to the tomato. Known and loved the world around, the tomato is the go-to ingredient in many, many international cuisines. It’s in both of the top condiments in the United States (catsup and salsa). It’s slathered onto just about every pizza we eat. It also plays the lead in one of Campbell’s most popular soups (my sister’s favorite). Isn’t it in that green salsa Mexican restaurants sometimes serve to contrast the red in their more popular salsas? It must be hard to have a relative who’s so much more talented than you are. Ask Roger Clinton, Billy Carter or George W. Bush. And to make matters worse, the tomatillo works in the same field as the tomato. It’s not some unknown starving his family as it pursues the dream of being an artist. The tomatillo is in the food business just like the tomato. It’s found something of a niche in Latin cuisines, in green sauces and even some guacamoles according to Epicurious.com. But tomatillos have never crossed over into the main stream. To be honest, I’ve only worked with them once before and that was for one of my Christmas soups a few years back. I can’t really remember what was in that one. I seem to recall that it was a green tamale soup or something, which sounds really good, especially since that’s what many Hispanic families get together to make during the holiday season. But that’s not the soup I made this week. This week’s soup is more of an ad lib. It started, as so many of these things do, at Caputo’s, where I fixed on the tomatillo bin and decided its time had come around again. I already had onions, garlic and a package of stew meat at home, so the supporting cast was pretty much set. The only obstacle was that I didn’t really know what the hell I was doing. After I peeled the husks off the tomatillos and started dicing up their insides, I was struck by the sensation of slicing through wet Styrofoam. Maybe not that bad, but nowhere near as juicy as a tomato. The taste was strange too, sort of tart but mild too, almost to the point of blandness. That’s when I made the mistake that I strongly urge you not to make. I added the juice of one lime. Well, it works with carne asada, right? Next came the cheese and mild chilies and the soup turned into something really good. In fact, it smelled fantastic. The only problem was the taste, which was a bit on the tart side. And for that I blame the lime. (Don’t use it people!) Really, I blame myself. If I had known what I was doing, I would have trusted the tomatillo to hold it’s own against the beef and Monterrey jack, but I didn’t and I feel terrible. I know what it’s like to have someone second-guess my abilities and rush in to salvage a situation I had well in hand. At least I can imagine what that’s like. You know, from books and stories I’ve read. I don’t have any actual experiences like that, but I do have a pretty good imagination. If you don’t believe me, just ask my brothers and sister. Heat the oil in a medium (3 quart) soup pot and sauté the onions, beef and garlic over medium heat until the onions are tender and the meat is nicely browned (6-8 minutes). Add the tomatillos, stock and seasonings and bring the soup to a boil. Then reduce it to a simmer and keep cooking, covered, for 20-30 minutes. Stir in the cheese and chilies, and simmer for an additional 15-20 minutes to let the flavors marry. Image Credit: In the Shadow of the Tomato composed by the author from clipart and MS Paint. As if the tomatillo didn’t have enough of a problem being overshadowed, this is Christmas soup week—seven days, 15 gallons of soup, canned. Which of this year’s soups would you want to see in a 32 ounce mason jar? Let me know in a comment. I’ll be reading and responding.